THE Melbourne to Brisbane Inland Rail Project has the potential to take cost burden out of the supply chain, according to a CSIRO pilot study which has examined the freight task near the central west New South Wales towns of Narromine and Parkes. THE Melbourne to Brisbane Inland Rail Project has the potential to take cost burden out of the supply chain, according to a CSIRO pilot study which has examined the freight task near the central west New South Wales towns of Narromine and Parkes. The pilot sought to understand the characteristics of local supply chains, including transport distribution patterns. It applied CSIRO’s Transport Network Strategic Investment Tool (TraNSIT) to the underlying data to identify and assess any competitiveness improvements in certain supply chains due to Inland Rail. 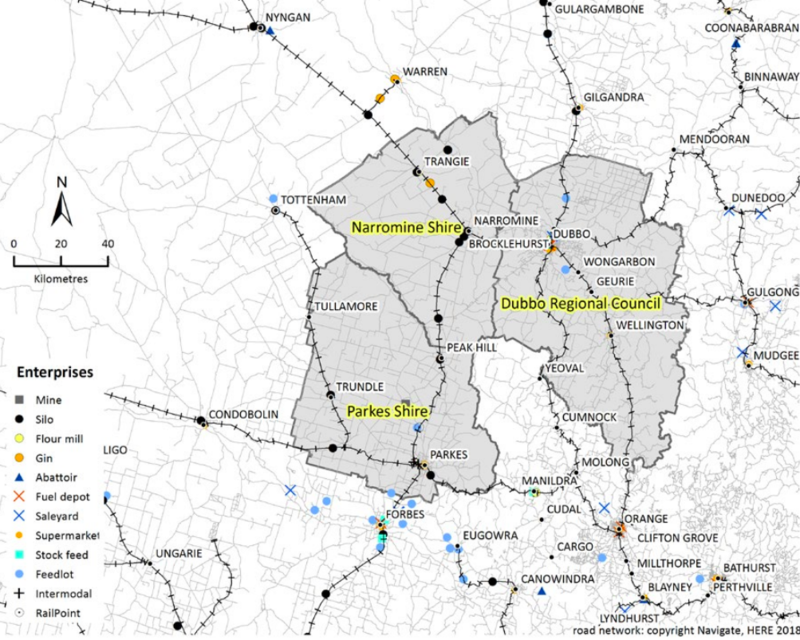 Stakeholders provided input to enable TraNSIT to establish a baseline of existing freight movements associated with the Parkes to Narromine pilot study area (Figure 1). The pilot sought to demonstrate the effectiveness of TraNSIT as a means of modelling complex supply chains at the national and local level. The study found wheat, barley and canola are the grains chiefly transported by road from farm to handling facility. Transport to port for export is typically by rail for bulk grain export via Newcastle and Port Kembla, while grain in containers for export via Sydney is partly transported by rail. Domestically consumed grain is sometimes railed to mills such as Manildra, and grain for stockfeed typically travels by road. Cotton products were transported by road or rail. Backloaded materials were cement and mining parts while fertiliser, not part of this study, would be considered in future. Fuel is a good example of the complexity of modelling freight. It was initially identified along with grain as being most significant in the study area, fuel trips forming over half the number of annual trailers passing through the study area, but was excluded because it lacked suitable storage and handling facilities locally. While some freight movements began or ended in the pilot area, meaning they were part of local supply chains, the pilot found that most freight had existing road transport legs exceeding 2000km such as horticulture freight from farm to market along the long-haul Melbourne-Queensland routes. The report cited potential cost savings from adoption of Inland Rail compared with existing baseline costs. Existing road trips shifting to inland rail could save average $76/t for horticulture and post-processed food. Alternatively, existing east coast rail transport for horticulture switching to inland rail could save average $31/t. Both instances depended in the appeal for users to make the change to inland rail and other less quantified factors such as current backload potential. “The Inland Rail has potential for the grains industry and domestic market supply chains,” Grain Producers’ Australia chairman Andrew Weidemann said. If potential transport cost savings were to result in a shift from road to inland rail, the study cited community benefit by a reduction of up to 63,000 heavy vehicle trips per year along various segments of the Newell Highway. On the other hand, nodes and corridors to new intermodal terminals giving access to inland rail would locally increase heavy vehicle concentration. TraNSIT analysis used operating cost models for heavy vehicles and trains rather than actual freight rates (prices) charged by transport service providers. The analytical capacity of the tool would increase as more data became available. The potential transport cost savings modelled using TraNSIT generally only relate to the freight movement. The multitude of logistical, relational and behavioural decisions throughout the supply chain will determine whether Inland Rail is used and how and whether potential benefits are captured. The results of this pilot should not be inferred as occurring elsewhere. Every region and supply chain will be different due to differences in the type and distribution of industrial activity relative to the Inland Rail corridor. The next phase of the supply chain mapping project will focus on the southern half of the Inland Rail corridor between the Narromine and Seymour regions. Inland rail: There is much posturing about the benefits of inland rail, much will depend on the competitive rail rates vs road transport. Can anyone nominate a freight rail service that is efficient and profitable unless tied to coal or ore exports? History suggests that commercial railway in Australia will struggle against the large transport operators.